Earlier this month I wrote about how Windows 10 holds a lock during too much of process destruction, which both serializes this task and causes mouse-cursor hitches and UI hangs (because the same lock is used for these UI tasks). I thought I’d use this as an excuse to dig slightly deeper into what is going on using a clunky-but-effective ETW profiling technique. This technique shows that a 48 instruction loop is consuming a huge chunk of the CPU time while the lock is held – the 80/20 rule is alive and well. And, thanks to some discussion on hacker news I know have an idea of what that function does and why it got so much more expensive in Windows 10 Anniversary Edition. This is usually too low-level, but sometimes it’s pretty handy to be able to see which instructions are consuming the most CPU time. Except, WPA won’t show me the actual CPU instructions. I tried using livekd to disassemble those addresses but it didn’t work – I don’t know why. Probably user error because I am actually not a kernel hacker. So, I ran dumpbin /disasm win32kbase.sys. 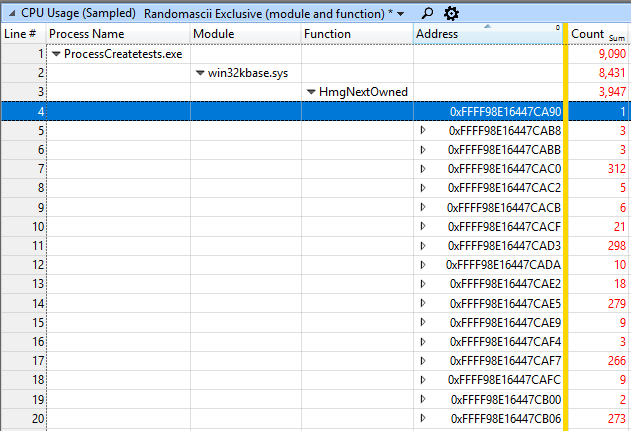 For some reason this refused to show symbol names which made finding HmgNextOwned in the output more challenging. But, I just searched for “CA90:” in the output (DLLs are relocated on 64 KB boundaries so the last four hex digits stay consistent) and I quickly found a function that started at such an address (it was the only one) and which had instruction addresses consistent with all of the samples. I then manually lined up the samples with the instructions in a spreadsheet and added commentary. The annotated disassembly can be found here (the main loop is in bold) and an onlinedissasembler.com version with branch diagrams can be found here. If there are three instructions executing simultaneously when the interrupt fires then which one “gets the blame”? If a load instruction misses in the cache and forces the CPU to wait then will the samples show up on the load instruction, or on the first use of the data? Both seem to happen. If a branch is mispredicted then will the samples show up on the branch instruction or on the branch target? What’s going on with the expensive cmp instruction on line 24 of the spreadsheet? If anyone has a good model for what happens to the CPU pipelines when a sampling interrupt happens I would appreciate that. Ideally that would explain the relationship between clusters of samples and expensive instructions. I suppose I could write test programs to explore this, but not today. If anyone wants to run the function through one of Intel’s emulators and share the results then that would be great. I hope that this lock-contention bug (apparently Windows: 12699333) is fixed by the Fall Creators Update of Windows 10 so that I don’t need to reboot my machine so frequently. 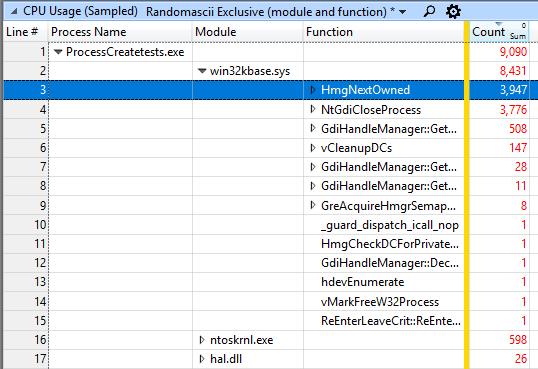 In the original trace where I discovered this issue I also see that win32kbase.sys!MultiUserGreCleanupHmgOwnRemoveAllLocks seems to be consuming a lot of CPU time – I don’t know what the significance of that difference (more CPUs? different Windows 10 version?) might be. There’s some good hacker news discussion of this post here. In particular, this comment links to this article which explains the Windows 10 Anniversary Edition changes which are probably the root cause of the problem. It sounds like Anniversary Edition changed the management of GDI objects to avoid leaking kernel addresses and that made HmgNextOwned more expensive, thus triggering the visible serialization of process destruction. 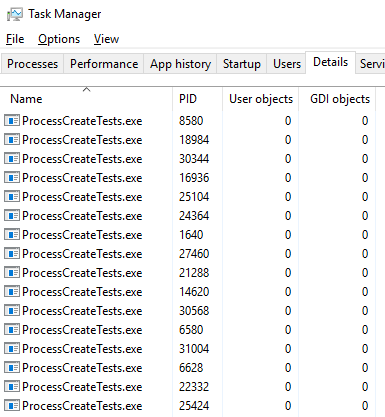 The other hilarious thing about this bug, as far as I can tell, is that all of this iteration over the GDI object table happens even when the processes in question have zero GDI objects. 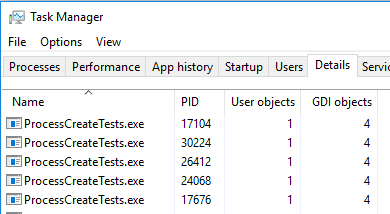 Maybe somebody needs to add an early-out for that case, because right now it looks like a lot of CPU time is spent looking for objects that have in fact never been allocated! This entry was posted in Investigative Reporting, uiforetw, xperf and tagged UI hangs, wait analysis, WIndows 10. Bookmark the permalink. An interrupt will force the processor state to become consistent. The interrupt handler will never see speculative state and the IP in the interrupt frame will be the instruction was interrupt and it will be re-executed (for real) when the interrupt handler returns. Any interrupt or exception forces the CPU to throw away all speculation, retire any preceding out-of-order instructions and generally look like the ideal sequential in-order x86 implementation that the CPU tries so hard to pretend to be. Hmg is GDI-speak for a GDI handle (like hDC, etc) so I guess this function is running down the global GDI handle table looking for handles owned by the terminating process so it can clean up. I would guess there’s a GDI handle leak somewhere (bug), and the fact that console processes have somehow gotten tagged as GDI-using processes is the second bug probably introduced when they redid the console subsystem to be fancy. The brief version is that Intel will not even guarantee that the profiled interrupt will trigger precisely on the instruction causing the event. Depending on the mechanism WPA used, the interrupt is triggered after the instruction. Inside the processor, it has a structure for tracking what instructions are outstanding. Most likely, the interrupt is marked on the oldest instruction, such that when it retires (i.e., is completed) then the interrupt is triggered. Any news from MS regarding this bug? None that I can share. ok, thanks for the info. Wouldn’t it be magnificient if MS could take a look of few other UI responsiviness hampering code paths at the same time 🙂 ? I have not noticed that, but I’ll watch for it.